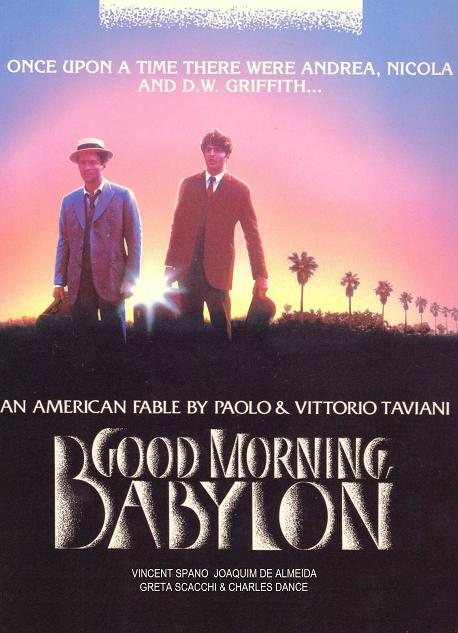 Note: To honor Vittorio Taviani, who passed away this weekend, I am posting my original review of Good Morning, Babylon — my favorite of the many films he co-directed with his brother, Paolo Taviani — which I first saw at the 1987 Cannes Film Festival. There is a kind of immortality one obtains only through art. And that is what Paolo and Vittorio Taviani lovingly celebrate in Good Morning, Babylon, their richly textured, radiantly photographed fable of Old World tradition and New World innovation. The film follows two young brothers from their Tuscan village, where their family works at restoring the splendor of time-ravaged cathedrals, to the Hollywood of 1916, where D.W. Griffith is inventing the syntax of the first great 20th-century art form, cinema. Griffith, played as an avuncular visionary by Charles Dance, becomes a father figure for Nicola (Vincent Spano) and Andrea (Joaquim De Almeida), and invites them to bring their artistic legacy to his most ambitious epic, Intolerance. The stonemasons eagerly accept, and wind up constructing eight huge elephants as temple decorations in the silent classic's lavish Babylon sequence. Not coincidentally, the elephants are large-scale replicas of designs they carved for a cathedral back in their home village. The Tavianis, heretofore best known for their folk tales about Italian peasantry (Padre Padrone, Night of the Shooting Stars), doubtless see much of themselves in Nicola and Andrea. Like the young immigrants, the Tavianis are inseparable collaborators who were raised in a rural Tuscan village, and who grew up to accept cinema as their means of artistic expression and spiritual self-preservation. Perhaps because of these strong autobiographical links, and most definitely because of the Tavianis' great love for film, Good Morning, Babylon is highly romanticized in its rendering of its lead characters, and in its depiction of early Hollywood as a golden-lit wonderland. The actors, technicians and directors are seen as exuberant pioneers, intoxicated with the knowledge they are doing and making things no one ever has before. For them, filmmaking is at once a daunting adventure, a raucous ritual, and a means of joining total strangers as lovers and comrades on and off the set. After decades of movies that have taken a far less generous attitude toward the Hollywood dream factory, Good Morning, Babylon comes as a refreshing, reinvigorating change. It reminds us of a time marked by innocence and idealism, and of the reasons why many of us fell in love with movies in the first place. Throughout the film, a mood of ingenuous optimism is beautifully sustained — musical, almost, in its intensity. The performances are perfectly attuned to the unaffected sincerity of the Tavianis’ celebration. A good thing, too. With a misplaced touch of irony, or a self-conscious emphasis on the wrong line, the whole illusion would be shattered. Dance risks audience ridicule when, as Griffith, he joyfully exclaims, “I love moviemaking!” But even if you smile at the character’s unabashed enthusiasm, you won't laugh. Greta Scacchi and Desiree Becker are utterly charming as bit players who fall in love with the Tuscan immigrants, despite their initial resolve to date only directors or producers. In one of the movie's sweetest scenes, each brother offers his sweetheart a firefly he has captured. Then, as a comic counterpoint, the brothers, not quite fully fluent in English, try their hand at love letters — using flowery phrases such as “You are as beautiful as a snowy mountain!” — that become a running gag all over the studio backlot. Occasionally, the Tavianis reveal their own awkwardness at working in another language. Some of the English dialogue sounds affected and overly precise, like a too-literal translation. (English subtitles are provided for Italian-language scenes.) At other times, the measured pacing and the gorgeous landscapes, familiar from the Tavianis’ Italian films, seem distractingly inappropriate for this particular story. In the end, though, the relatively minor flaws of Good Morning, Babylon are easily overlooked. The final scene, where Nicola and Andrea make a valiant attempt to literally immortalize themselves through their new art, achieves a deeply affecting, bittersweet poignancy. It is an altogether fitting conclusion for a movie that pays such eloquent tribute to the magic of moviemaking.